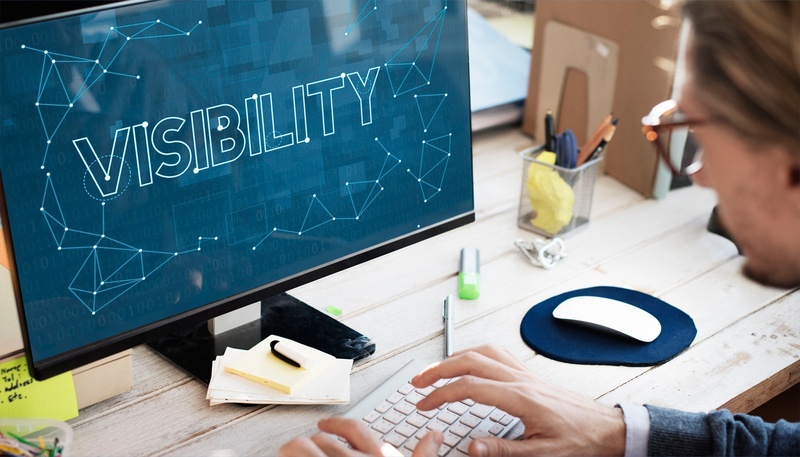 aACE’s advanced logging features promote visibility and accountability by tracking key changes made to records, providing a clear audit trail, and ensuring you always know who did what and when. To learn more about these features, let’s look at how fictional company aACME Education Solutions uses them in their day-to-day operations. Sales rep Jamie Gianelli enters an order for 60 math textbooks placed by Sam Patel for the Montboro School District. 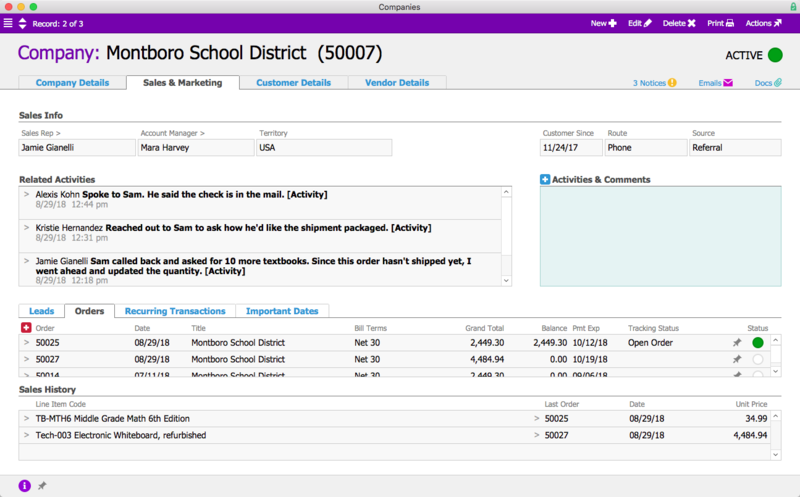 When Sam calls back later to add an additional 10 textbooks, Jamie updates the order’s quantity and enters a note in the Activities field to document the reason for the change. The order record’s log captures both the change Jamie made and her comment explaining it, so it can easily be seen by anyone with access to the order. 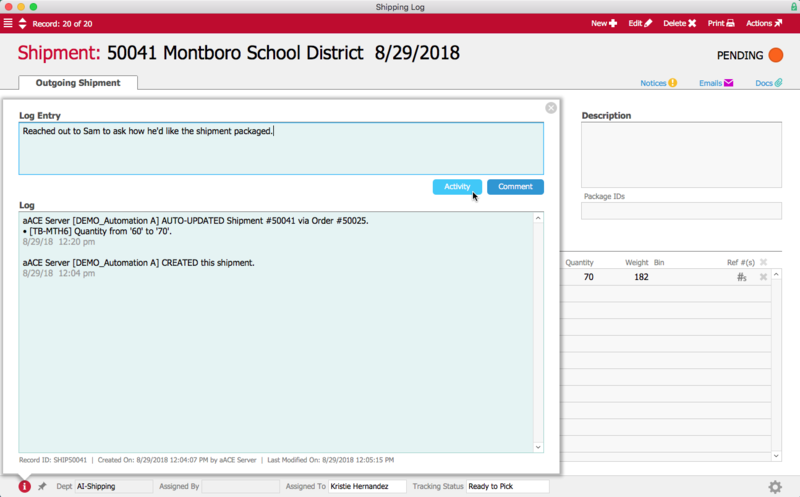 When Jamie updates the quantity of textbooks in the order record, aACE automatically updates the quantity in the associated shipment record. In the warehouse, Kristie Hernandez can see when the change was made and by whom in the shipment record’s log. If Kristie needs to contact Sam with a question, she can add that interaction in the log. 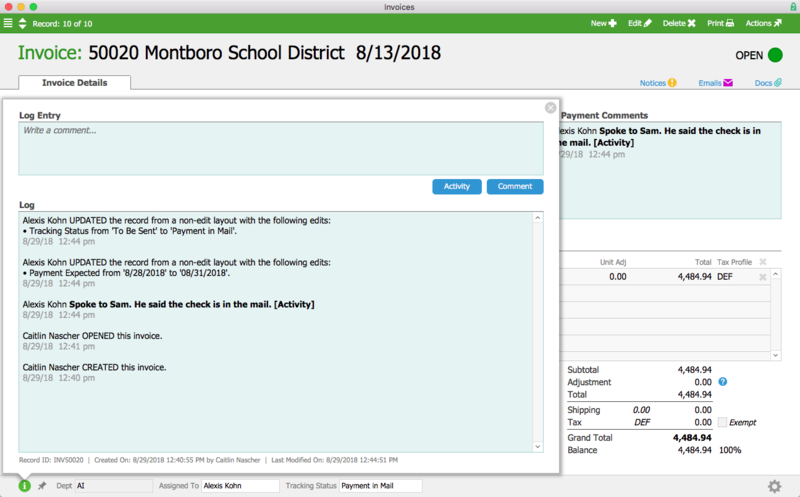 Over in the A/R department, Alexis Kohn looks through open invoices and spots one from the Montboro School District that’s past due. She gets in touch with Sam and learns that the check had been sent out that morning. Alexis changes the invoice’s tracking status to “Payment In Mail” with an expected payment date a few days ahead and a comment noting her conversation with Sam. These changes are captured in the log, so when her supervisor notices that the invoice is marked as current despite being past the due date, he can easily find the explanation. 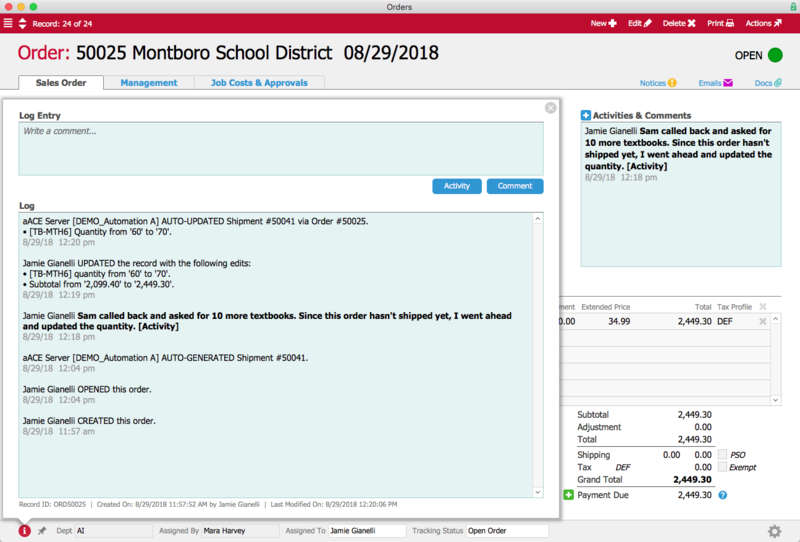 All of these activities have also been captured in the Montboro School District’s Company record, allowing Mara Harvey, the account manager, to keep track of interactions between Sam and various members of the aACME team. Each activity in the log links back to the record where it originated, allowing Mara to quickly view the source of an activity with one click. But what if senior management needs to review everything a user has done in the system, not just their activity within one record? 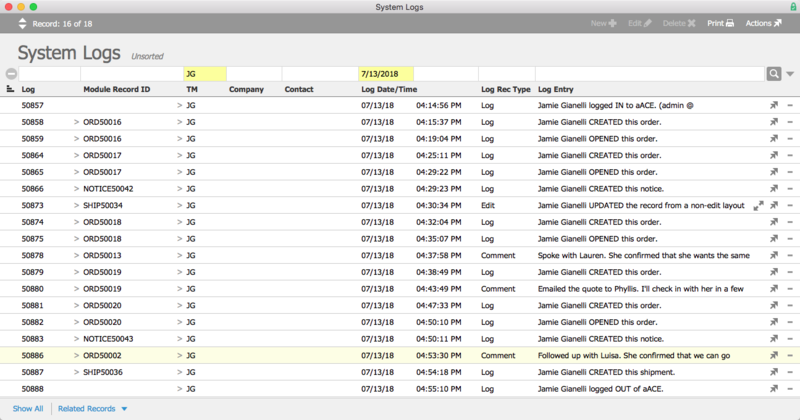 aACE’s System Logs module allows system administrators to view what a particular team member has been doing in the system across a given period of time, with links to the related records. This allows administrators to find records when users swear they completed a task but their managers aren’t sure it was done. It also gives HR managers the ability to review a user’s activity more broadly. Let’s say Jamie's supervisor has a question about what she was doing on July 13th. Jamie says that she took several orders that day, and spoke to multiple clients. But her supervisor doesn’t recall that happening. They turn to their aACE system administrator to clear things up. With one quick search, they can view the logs Jamie generated that day, including links to the relevant records. Now that we’ve seen how aACE’s advanced logging works for our fictional company, take a look at our American Christmas success story to learn more about how this feature helped a real aACE client increase visibility throughout their business and cut their internal follow-up time by over 50%. Discover even more ways that aACE works for everyday businesses when you check out our other success stories below.